In a professional medical environment, keeping patient records, dosage information and medication safe, secure and organised is crucial to providing high-quality care. 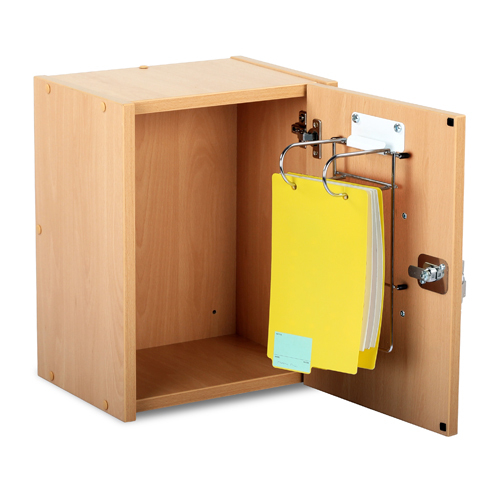 The Bristol Maid Small Wooden Patient Self -Administration Cabinet with CAM Lock is designed to provide this organisation and safety, allowing for the storage of one MDS frame, with additional storage space inside. Designed to be used within a care or nursing home environment, this cabinet was made to be stored within a resident's room. Suitable for storage of one MDS frame with dividers and name cards (maximum 100mm depth), this cabinet allows for plenty of storage in a secure and neat fashion. A single-point locking, secure CAM lock is fitted to the door, ensuring security and peace of mind for the carer. This lock is supplied with two keys. This cabinet is constructed from durable melamine-faced MDF, with mounting holes provided in the back to secure the cabinet to a surface (fixings not included). Please note that this cabinet is supplied by itself, without any MDS frames. Do you have a question about this product or would you like to purchase it? No problem at all. Simply call us on 020 7501 0593 between 09:00 and 17:00 Monday to Friday. You can also email us with your question by using the form below. A member of our helpful Customer Care Team will respond to your enquiry personally as soon as they can. Please note that the Bristol Maid Small Wooden Patient Self-Administration Cabinet with CAM Lock has an estimated delivery time of approximately four weeks. We apologise for any inconvenience that this may cause and advise you to consider this lead time when placing your order. If you would like any more information about delivery expectations for Bristol Maid products, please contact our customer care team on 020 7501 0593. Sign up for our completely free newsletter and we'll keep you informed of all the latest news and products added to our range. Just enter your email address and hit 'sign up'. (excluding Bank Holidays and Christmas). Copyright © 2019 Medical Supplies & Health and Care. All rights reserved. VAT Reg Number 970 1473 25. The Destination for Medical Supplies. When you spend £65.00 on your order. We stock thousands of the very best products. If you aren't 100% satisfied, on every order. Our loyalty scheme means you earn as you spend.